There are a total of fourteen different Dewalt router models available when you count all the different combinations, with various bases, kits, etc. However, they are all based on five basic models, ranging from 1.25 HP to 3 HP. Most models get good reviews overall, averaging better than four stars out five. There are a number of really happy owners reporting on the various woodworking forums, as well as on retailer's websites. Most owners really like the ergonomics on the Dewalt wood routers. The more popular models also have a soft start feature and a spindle lock for easier bit changes. There are a few complaints on each of the Dewalt routers, though that I will cover below. The DWP611 and DWP611PK are compact routers with a 1/4" collet. The 1.25 HP motor is variable speed, from 16,000 RPM to 27,000 RPM. The motor has a soft start feature, a spindle lock, and there are two LEDs built in to light the work area. The DWP611 has a fixed base, and the DWP611PK comes with a plunge base. People really like the LEDs, and a couple of folks commented that they could never go back to using a woodworking router without this feature. The plunge base works smoothly, the motor has plenty of power, and the soft start feature is nice. Several owners commented on how the cut depth adjustment is precise and easy to use. The DW611PK won "Best Overall" in a comparison test of twelve trim routers in Taunton's 2012 Tool Guide. They said it was the easiest to use and the most versatile of the bunch. - This is my new favorite tool! I've had my DWP611PK for about 3 months now, and this thing is a wolf in sheep's clothing. It is light, and easy to handle, but can tackle most of the jobs my PC690 does. I have used it to rout rabbets, do chamfers and roundovers, rout signs, and do template routing. This past weekend, I routed a 3/8" x 3/8" rabbet in hard maple with no burning or motor strain under the load. There are a few minor complaints that popped up repeatedly though. As a compact router with a 1.25 HP motor, it will only accept 1/4" bits. The supplied collet wrench is rather cheaply made, and the adjustment knobs are also rather small. The most common complaint is that neither version comes with a case. That's about it. There were almost no complaints about the performance or reliability of the DWP611 and DWP611PK. Both versions are reportedly great tools if a compact router will suit your needs. The DW616 series of Dewalt routers are a step up in size and power. They will accept both 1/4" and 1/2" bits, and come with a 1.75 HP motor. This is the "entry level" full-size Dewalt router, so it doesn't have as many features as the more expensive models. For instance, the motor has a single speed (24,500 RPM), there is no soft start feature, and they do not have a spindle lock. All three versions come with a concentricity gauge, 1/4" and 1/2" collets, and two wrenches. The DW616 has a fixed base, and the DW616K comes with the fixed base and a plastic case. The DW616PK comes with both fixed and plunge bases, a case, and a vacuum adapter. 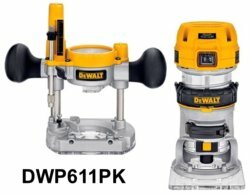 The DW616 doesn't appear to be a very popular choice, as there aren't nearly as many reviews available as there are for other Dewalt routers. This may be partly because the next step up the ladder (the DW618 series) is about the same price, but has more power and features. Owners like the ergonomics of the DW616, and several commented that the action of the plunge base was very smooth. It has plenty of power for most routing jobs, and the flat top makes it easy to stand the tool upside down for bit changes. I did not find any reports of failures, which is rare with a power tool. The only real complaints were the lack of features - no spindle lock, no soft start, and no variable speed. However, each of those complaints can be remedied by stepping up to the DW618 series. There are actually six, count 'em, six! different model numbers available in the DW618 Dewalt router lineup. The DW618 has a 2.25 HP motor with electronic variable speeds from 8,000 to 24,000 RPM. The motor has the soft-start feature and there is also a spindle lock. It comes with both 1/4" and 1/2" collets. Although the majority of the reviews for the DW618 series as a whole are really good, there is something a little odd going on. While the models with the extra bases average well over four stars, the base model DW618 without any extras actually has a poor overall rating! This is mainly due to motors that have failed after only a small amount of use. There are a few reports of motor failures with the "accessorized" models, but not a high enough number to really bring the ratings down much. The DW618PK Dewalt router tied for "Best Overall" in Taunton's 2010 Tool Guide comparison of eight different woodworking router combo kits. In general, owners love the ergonomics, the smooth plunge action, soft start, and the low center of gravity. A number of folks commented on how precise and easy to us the depth adjustment is. The DW618B3 version with all three bases is a very versatile kit, making it a great value. There were a few complaints (besides motor failures) that popped up from time to time. The location of the power switch is awkward for some people. Although several people commented on how easy it is to swap the motor into the various bases, several folks had trouble with the motor being too tight in one or more bases. There were several reports that the collets came apart, although one owner believed it was due to using cheap router bits that had undersized shanks. Lastly, a few owners found that the plastic button on the spindle lock would come loose from the steel pin that actually locks the spindle. When that happens, the spindle says locked even though you have released the button. One owner of the DW618PK mentioned the reports of motor failures, and suggested buying an extended warranty - he loves the tool enough that he would replace it with the same model if his motor failed. With the three year warranty that comes with a Dewalt router, I wouldn't hesitate to get one of the kits with the multiple bases - the overall ratings of those models speak for themselves. The DW621 is a dedicated plunge router. It has a 2 HP soft-start motor with electronically variable speed control. The RPM range is from 8,000 to 24,000, and the motor maintains the selected speed under load. It comes with both 1/4" and 1/2" collets and has a spindle lock. The depth adjustment uses a rack and pinion system with 1/256" increments. It also has a built-in dust collection system, and comes with a template guide bushing adapter. The DW621K is the same tool, but comes with a hard shell case and an edge guide. One unusual feature on this Dewalt router is the shape of the base. Most woodworking routers have a base that is completely round, but the DW621 has "flats" on the front and back, and is round on the sides. Some folks like this feature, others don't. The renowned router expert Pat Warner names the DW621 the ultimate router. On his website, he says, "... if I could have but one router, this would be it." On the Sawmill Creek forum, he praises the "precise depth target-ability, light weight, plenty of power, and glass-smooth plunge stroke". Others praise the effective dust collection and the soft-start feature. As was mentioned earlier, some folks love the flat sides on the base, and others don't. A few people also didn't like the position of the switch. The DW621 Dewalt router isn't well suited for use in a table, because it is awkward to adjust the height and reach the power switch when mounted in a router table. A couple of owners found that the bit was not perfectly centered in the base. There are also a few reports of motor failure and failure of the electronic module, and those reviews are what brings the average rating down. Aside from the failures, most owners are very happy with the DW621. The largest Dewalt router is the DW625. It is also a dedicated plunge router like the DW621, but the DW625 has a 3 HP motor. It has electronically variable speed control, with an RPM range of 8,000 to 22,000. It also has the soft start feature, a spindle lock, and rack and pinion depth adjustment. A number of owners commented on how powerful the DW625 Dewalt router is, and on how the low center of gravity makes it easy to handle. The smooth plunge action also got several comments. The most common complaint is that even with the router fully plunged, the bit does not extend far enough out of the router. The operation of the switch was also awkward for a few folks. I only found two reports of failures, and one of those was way back in 1999. Overall, the Dewalt routers are good quality machines with great ergonomics. To get detailed specs on all of the Dewalt router packages, you can visit Dewalt's website. Most owners are really pleased with their routers. 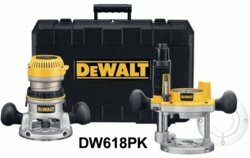 Although there are reports of failures in the DW618 and DW621 models, those are out of thousands sold over the years, and there is a three year warranty on all the Dewalt router models if you should have a problem.